St George’s Chapel contains a magnificent display of heraldry whether you look at the banners of current members of the Order of the Garter, stained glass windows, decorative roof bosses, carved stone and woodwork or the stall plates of Garter Knights stretching back to the 14th century. 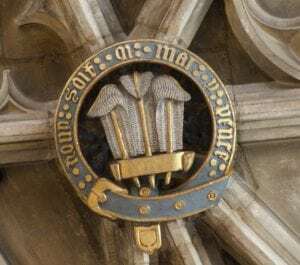 Sometimes it can be confusing to work out the difference between a Coat of Arms, a Crest or a Badge and this small article aims to assist the reader to distinguish between those sometimes confused terms. For no other reason than fun each example shown below uses animals in some shape or form. 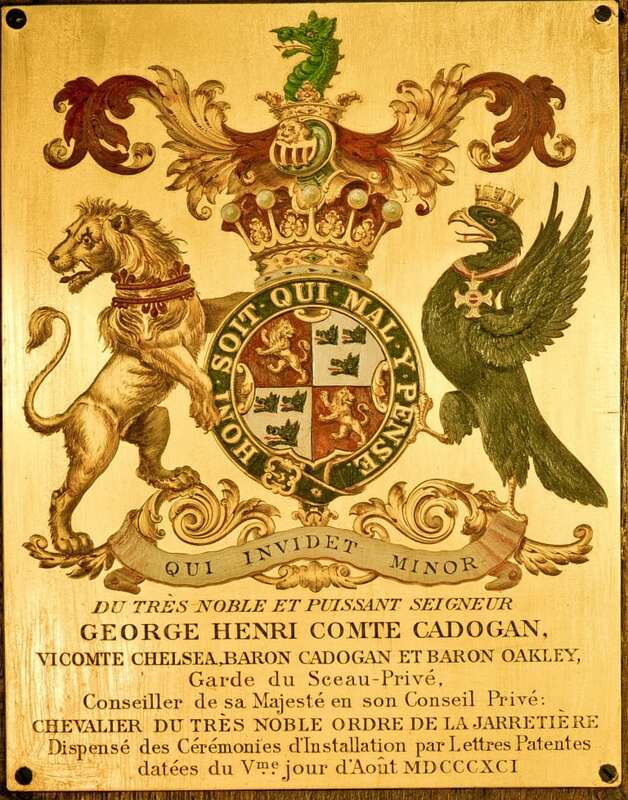 This stall plate is that of the 5th Earl of Cadogan (1840-1915) and is located on the south side of the Chapel. It shows a full ACHIEVEMENT OF ARMS in that the shield which bears a coat of arms is surmounted by a helm, coronet of rank, mantling and crest and has on either side a pair of supporters; below the shield is a motto. The coat of arms is quartered and includes golden lions (rampant reguardant i.e. standing up and looking back) and black boars heads (couped i.e. cut off); the crest is a the head of a green dragon and the supporters are a lion and an eagle. Originally designs were painted onto shields to distinguish one person from another in battle particularly when the face was completely or partially obscured by a helm. The shield design was then repeated onto cloth which was worn over armour – hence the phrase COAT OF ARMS. 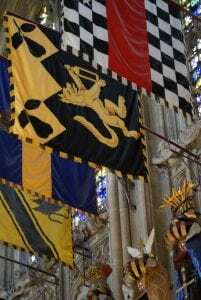 Over time rules and regulations came into being to ensure that a design was used by one person alone; this was overseen by Heralds who were formed into the College of Arms by King Richard III. 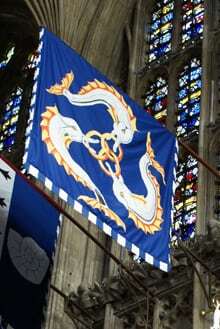 The design, unique to the individual, was sometimes used on a flag carried by or beside the Lord or Knight in question; nowadays you can see this in the form of Garter Banners that hang above individual seats of Knights of the Garter in the Quire of St George’s Chapel. The two examples shown here are those of Sir Thomas Dunne (a wolf) and Lord Boyce (three dolphins recalling his Royal Navy career). In addition to the coat of arms another way of distinguishing someone in full armour was by a CREST on top of their helm. In early days this was often no more than coloured feathers but gradually designs became more complicated. Examples shown here are the stag crest of Sir John Major in the Quire and the peacock crest of Lord Roos on his tomb in the Rutland Chantry on the north side of St George’s Chapel. 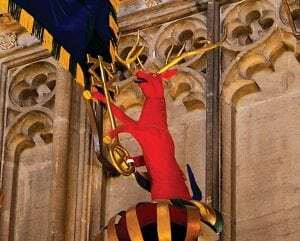 The red stag (John Major was MP for Huntingdon) carries a key with an ‘X’ for 10 Downing Street at one end and a ‘M’ for Major at the other. The descendants of Lord Roos became the Dukes of Rutland who still use a peacock as a crest; live peacocks were re-introduced into the grounds of Belvoir Castle to mark this long standing heraldic connection. Whilst a Coat of Arms was particular to an individual a BADGE could be worn not only by the Lord or Knight but also by his household or retinue to show in whose service they were. In 1475 King Edward IV ordered that St George’s Chapel should be built; he gave that order to Bishop Richard Beauchamp. 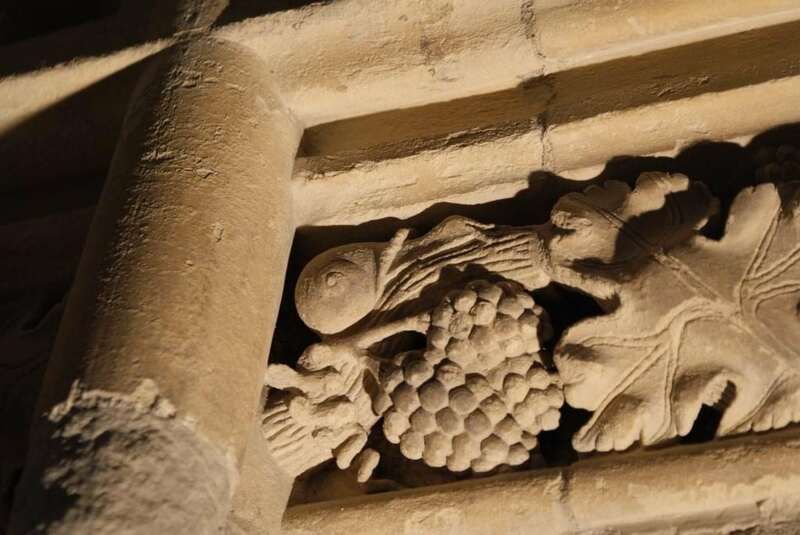 Bishop Beauchamp’s badge was a snail; as a result carved snails can be spotted in the wood and stone decoration of the Chapel. This example is in the North Quire Aisle. 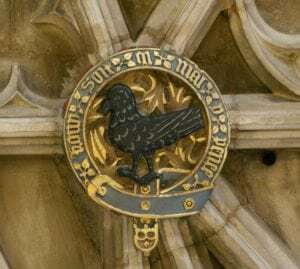 In the roof of the Quire (vaulted between 1506 and 1509) are a number of badges including the black raven of Sir Rhys ap Thomas and the still familiar three feathers of the Prince of Wales. 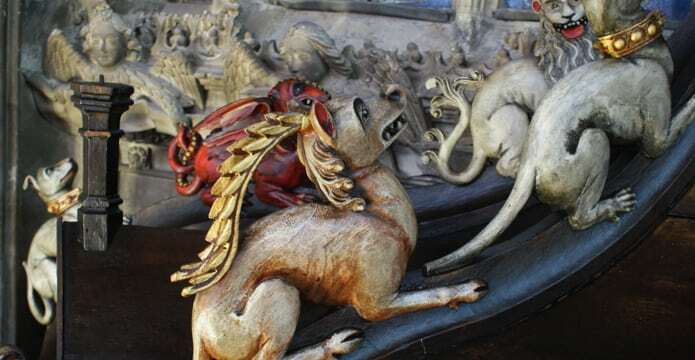 This final photograph shows just some of the animals on the roof of the window oriel window put in place by King Henry VIII. 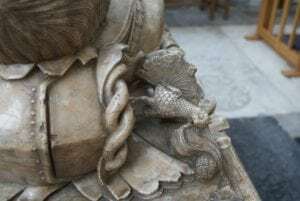 The Red Dragon, the Greyhound, the White Lion of Mortimer, the Lion of England and the Yale of Beaufort and a Hind are all included even though some cannot be seen in this photograph. Previous PostPrevious A link with the past…. Next PostNext What are the Friends of St George’s?